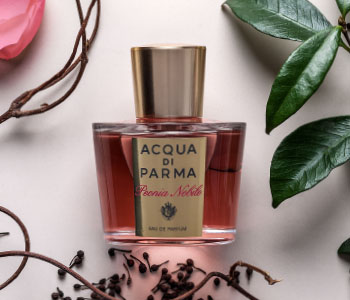 Unveiled as the flower of the gods, Acqua di Parma Peonia Nobile exudes a magnetic femininity that leaves you wanting more. An advocate of voluptuous femininity, delicate floral facets grace your senses with the ultimate delight, transporting you to a floral fantasia of sublime elegance. Peonia Nobile continuously blossoms with sensuous allure like the overlapped petals of a noble peony, accentuated by glowing amber and sparkling raspberry facets . Experience the empowering air of this truly exquisite blend from Acqua di Parma.